Which one is more efficient: tf.where or element-wise multiplication? I'm implementing a loss function that will use a mask tensor(M) consisting of 0s and 1s to eliminate some loss values given predictions(P) and ground-truth(G) tensors. So, which will be more efficient in terms of running time? I did the benchmark and it is quite clear that multiplication is far better than conditional selection. Not the answer you're looking for? Browse other questions tagged python tensorflow deep-learning keras loss or ask your own question. 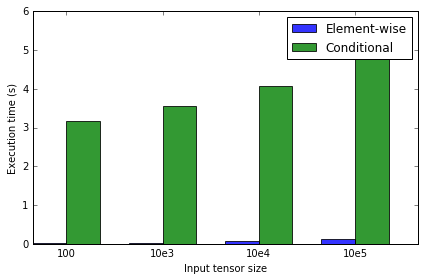 TensorFlow: Implementing a class-wise weighted cross entropy loss?